Quilting is on my marvelous list of things to do in life. There is just something so lovely about matching and molding pieces of fabric to create a distinct work of art. It really is so magical. They (not really sure who they are) speculate that quilting has been around for thousands of years. Way back to the 1100BCs in Egypt. 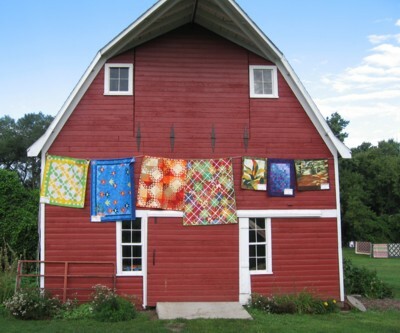 Throughout history quilting has been used for practical purposes such and cushion inside heavy metal armor, European women were wearing quilted petticoats to ward off the harsh winter cold, blankets, wall hangings to prevent the cold from coming through the walls. So many ways to keep people warm, safe and comfortable. And then there is the visual beauty. The art of matching colors and textures, shapes and sizes, magnificent! Vintage Songbird has found a way to mix the two… Function and beauty. I have in my kitchen beautiful quilted wall hangings brightening up the room. But when the Haggen-Dazs enters the home I have a fantastic ice cream cozy to protect my hands from the harsh cold. what a clever way to use quilting for something other than a blanket. im very impressed! I love the barn picture. And the ice cream holders are great. I’ll have to check them out. I usually use a tea towel to hold on to my Ben & Jerry’s. what a great idea! 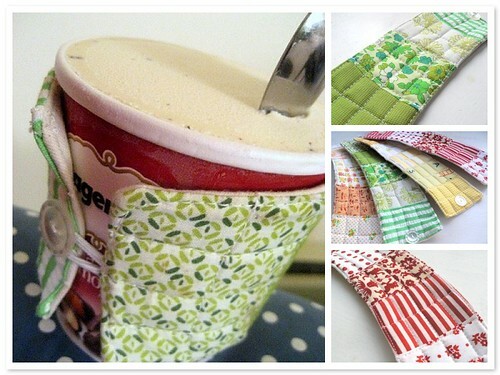 i usually use potholders when i eat ice cream!!! I find such lovely little treasures on Etsy and around town that I needed to share them with you all. Here on this simple happy blog you will find some of my favorite purchases that have made their way to me and stopped.